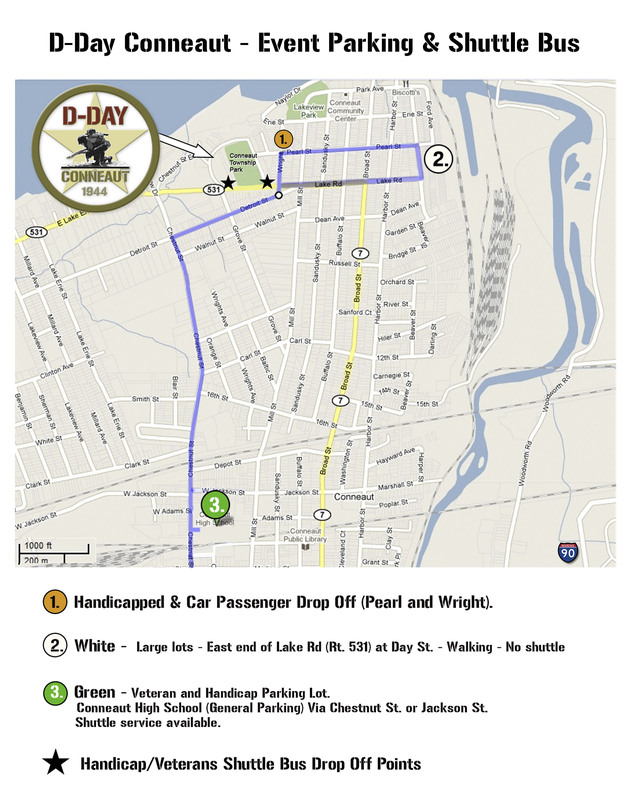 Join us for D-Day Conneaut in North-East Ohio's beautiful Ashtabula County. Right on Lake Erie sits Conneaut, Ohio, whose shore and beaches offer an uncanny resemblance to the Normandy cost of France. Come early! 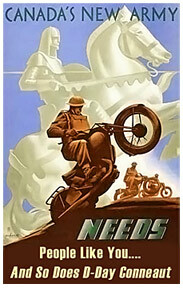 There is plenty to see and do for the reenactors, veterans, and families. Visit our Schedule page to see a complete program schedule and listing of events in and around Conneaut, all designed to help honor and celebrate the accomplishments of "The Greatest Generation". If your a first-timer, take a moment to read the information below to maximize your experience. 4 miles from the Ohio/Pennsylvania state line. It's just down the road a piece.... and well worth the drive. Just Google "Conneaut Township Park". Travelers may wish to fill up on gas if they are low when they arrive in town. We have been known to sell out all the gas in town. We are expecting all-time record numbers of attendees once again this year. 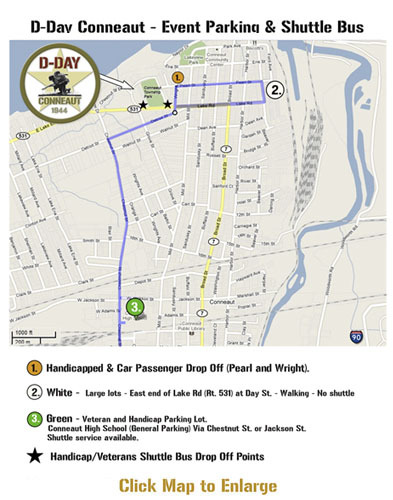 D-Day Conneaut attendees can get information before and during the event like detours, traffic incidents and emergency information specific to the D-Day Conneaut Reenactment by texting "Add" to 4402614470. To be removed from the list, text "Remove" to 4402614470. Lake Road will be reduced to one way traffic between Wrights Ave. and Chestnut St. from 8am - 6pm on Friday the 19th and Saturday the 20th. Traffic will flow East to West only during this time. There is no onsite parking at the park. There are ample parking areas around town served by our speedy shuttles both Friday and Saturday. There is no shuttle service on Thursday. (Parking is available Thursday only on side streets around the event.) Mobility impaired persons and veterans of WWII-Vietnam can park at the CN Dock Company on Day Street, which a wheelchair accessible van will frequent approximately every 15-20 minutes. Spectators can park at multiple lots around town. Watch for signs in town as you arrive for the most updated parking information, as some lots will close as they fill up quicker then others. See "Visitor Info" page for more details. Please consult the map and road side signage for free parking locations. A free quick shuttle service will run to and from all lots throughout the day Friday and Saturday. Plan your arrival to allow a little extra time getting to and from the park. Assistance will be provided to mobility impaired individuals. The shuttle drop off point, identified on the map, is located just 75 feet from the park entrance. Watch for our ample signs around town to direct you to the designated parking locations. Tour busses arriving at the event should drop off people at Grove St. and Lake Road. Please contact Bill Wiley for scheduling and available parking. There is no shuttle service on Thursday. Parking is available Thursday Only on side streets around the park. There is no onsite parking at the event. Friday's schedule of activities begins at 9 AM. The road network inside the park will be closed once the event begins. There is no on-site parking or road-side parking on Lake Rd. Please consult the map and road side signage for parking locations. Again there is no on-site or road-side parking on Lake Rd. by the park. Adequate, convenient and safe and free parking is available at multiple secure off-site parking locations. We recommend preparing for your visit by printing our schedule and the site map. All activities are out of doors so be prepared for any type of weather. Backpacks and small coolers are welcome, but please don't leave them unattended! You may wish to bring a blanket or lawn/stadium chair for viewing the battles and other demonstrations. Backpacks and small coolers are welcome but please do not leave them unattended. Shuttle locations are marked on the park map and by canvas awnings with benches. If you have limited mobility and would like a ride to your next destination within the park, please use this location for a pick up. Our cart drivers will circulate through the park and make regular stops to assist those in need. Loose something? Stop at our information booth to report it and see if it was turned in. find something? Please bring it to an information booth or ask one of our cart drivers to drop it off at lost and found. Dress for the weather and walking. Shade is limited and there is a good bit of walking to see the entire reenactment. Don't forget your sunscreen and perhaps an umbrella. The show will go on regardless of weather. Service dogs are welcome but pets or animals of any other kind are not permitted in the park due to the nature of the activities held during D-Day Conneaut. Thank you for your understanding. The "Encampments" (England-Allied Forces, Occupied France-Axis Forces, French Resistance) of living historians are located in distinct areas of the park. The Allied camp will be set up on the bluff in the main part of the park - England. The Axis forces and will be garrisoned south of the Valley Bridge in the meadow which lies beside the meandering creek, down on the west beach by the pavilion, and a new large German camp will be stationed on top of the hill on the west side of the park. This will be the main largest German encampment. This area will be known as Occupied France. The French resistance encampment is located on the hill near the Road to Victory battle area. On the South-East side of the park, we will once again be featuring a Commonwealth camp. We encourage everyone in attendance to visit all these unique and distinctive areas of dedicated reenactors eager to speak with you about their impression. If this is your first time at an reenactment, here is what to expect: During the battle scenarios, expect loud noises from simulated gunfire and artillery; very loud noises. Those with sensitive hearing may wish to bring hearing protection. We encourage you to purchase a commemorative program so you can read in more detail about the scenarios being played out in front of you. Between engagements there is plenty to look at. We encourage you to ask questions to the hundreds of reenactors who are representing all aspects of the conflict, but please ask before attempting to handle any items. Most items on display are privately purchased by the reenactor and then restored and maintained at their own expense. Through these artifacts presented by our living historians, D-Day Conneaut is attempting to educate, inform, enlighten and pay tribute to the men and women who were thrust upon each other in a horrific global struggle; a struggle that may have vivid memories for some of our visitors. Rest assured that no reenactor or event planner is a proponent of the political ideals of the era. Reenactors take great pride in their living history impressions and are eager to talk with you about what they wear and what they carry. D-Day Conneaut will have a limited FM Range radio station set up to broadcast music and information throughout Conneaut Township Park during the event weekend. Tune your FM radio to 93.1 to keep up to date at the event. WOW is planning to repeat for 2016 is our Special Broadcast for Friday and Saturday of D-Day weekend. On Friday from 4p-Midnight and Saturday from 9am till Midnight, WWOW Radio will break format and Broadcast the music from the World War 2 era. Plus also mixed in with our music mix will be actual broadcasts from WW2 such as FDR's address to congress declaring war, Eisenhower's radio address after the invasion of Normandy and other News Actualities that will be mixed in with our Special Music presentation. WWOW will also broadcast information on the D-Day Event itself. Saturday night at 8pm to Midnight ...WWOW will broadcast a series of WW2 radio drama's such as "The Shadow", "Gracie Allen" the "Great Glidersleeve" and others. These are programs that the USO broadcast for the Troops back then. Are you an amateur radio operator? The Conneaut Amateur Radio Club is providing radio operators to give you "Over the Air" help on your journey into town. You can check in with one of their operators on the 147.390 +600 khz PL 131.8 Repeater. They will be able to give you directions to parking lots and assist you on getting around town. Operators will be"On Air" From 7am to 2pm on Friday and Saturday. Or just check-in to say hello and let us know where you are from. Are you on APRS? If so take advantage of it. During the event on the 144.390 National APRS Frequency, objects will be broadcast over APRS with parking lot locations and main park location. For our reenactors, camping with your unit is encouraged and available on site. Numerous bed and breakfast inns and a few quaint motor lodges are also located within a short distance of the park/event. Please consult our sponsor listing on the right for additional links and information about our recommended lodging sites. For a list of other lodging options in the Conneaut area, follow this link.